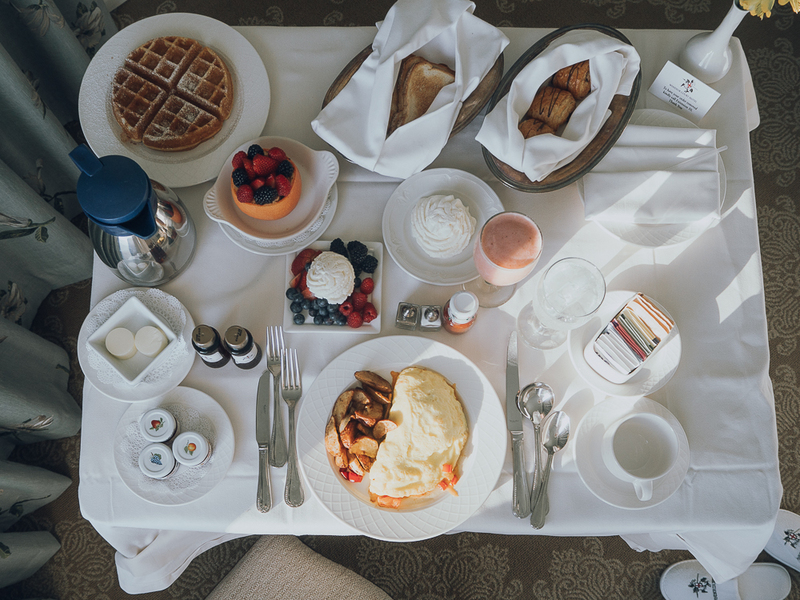 Thanks to The Windsor Court Hotel for sponsoring this post. As always, all opinions in the post are my own. After experiencing something do you ever feel like that it was made just for you? 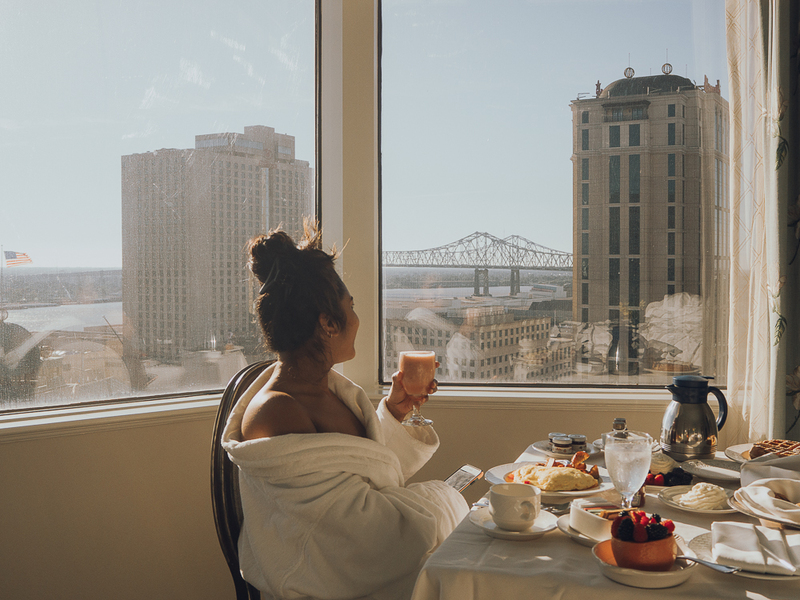 Last month Back in October 2018 (figures I never published this post :o), I fully embraced solo traveling (read WHY TRAVELING ALONE IS ABSOLUTELY IMPORTANT here) as well as the elegance of New Orleans at this luxurious Windsor Court Hotel. The vibe of the hotel jived with mine from the moment I walked into the hotel. 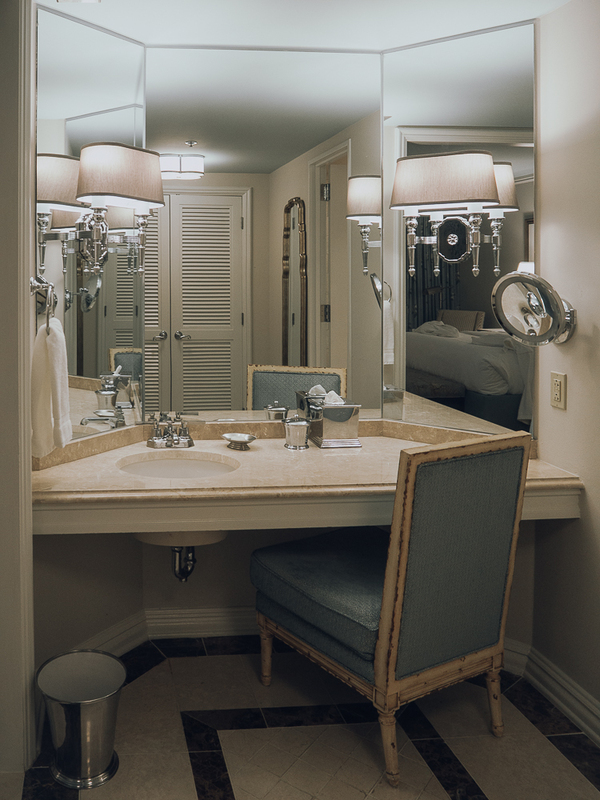 It has that old-world English charm and class to it, kind of makes you feel like a queen. My stay here played a huge part in just how much I enjoyed traveling solo. 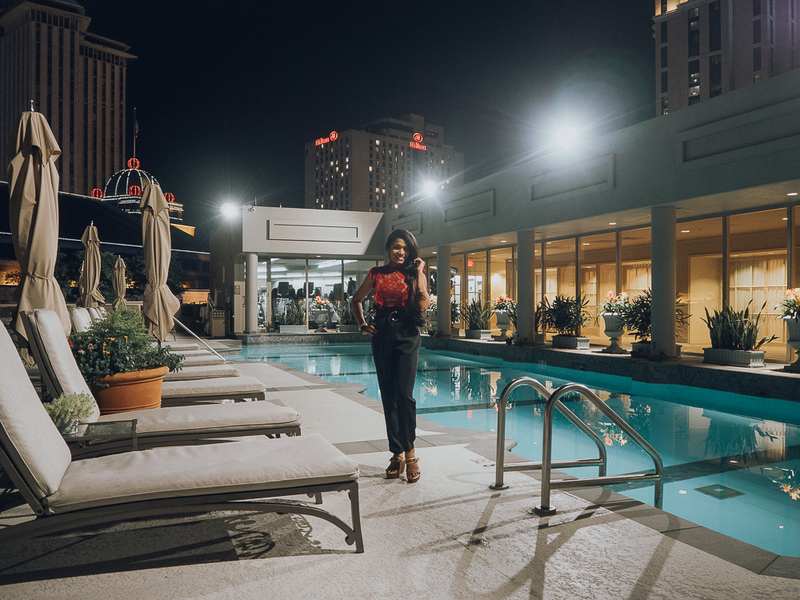 Don’t get me wrong, I would have loved this hotel just as much if I came here with Vinay and Aarush, but it takes something extraordinary to make you feel all sorts of special which is exactly what is needed when you travel alone. And as I mentioned in this post, I couldn’t have chosen a better hotel to stay at during my first time traveling alone. When I arrived it was pretty late in the night and I didn’t get much of a chance to check out the hotel and its amenities. I thought I would head straight to my suite and fall plop on the bed. But that was far from reality, I couldn’t stop swooning over every detail in my magnificent premium suite - from how spacious it was (my suite came with a huge master bedroom, a large living room, a foyer/bar area) to the blend of English and French decor to the Italian marble bathroom to the separate vanity area to the double French doors to the use of pastel colors to the balcony to the cheese and fruit board spread to the views through the window to the sparkling lights outside the hotel. Told ya, #swoonworthy! I must have swiftly walked (or at least that is how I felt) around this huge suite which I had all to myself at least a few dozen times, sometimes simply admiring the details and sometimes snapping a pic or two, but mostly enjoying the calm and quiet of the place (no running behind a toddler trying to stop him from hurting himself, or no trying to feed him when all he wants to do is explore the suite, by which I mean, pull everything and throw it on the floor #momlife!) And when I finally went to oh-so-soft-bed, it wasn’t to hit the snooze button, but it was to watch hours of Netflix before I called it a night (or early morning ;)). 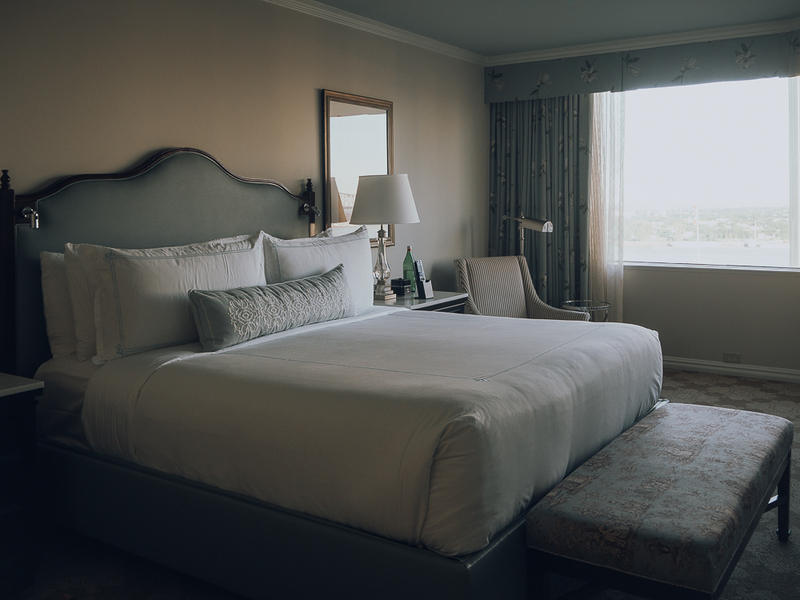 For a second there I did think that I should just laze around in my luxury suite and check out the rest of the hotel, but the practical me won the mindful argument, I mean, who was I kidding, it was already a stretch that it was noon, I was in a new city and yet I wasn’t out and about exploring it. So I checked my makeup one last time in the mirror as I reluctantly walked out the door. I got a walking tour of the entire hotel by the fabulous manager, who shared some interesting history and facts about The Windsor Court Hotel with me. 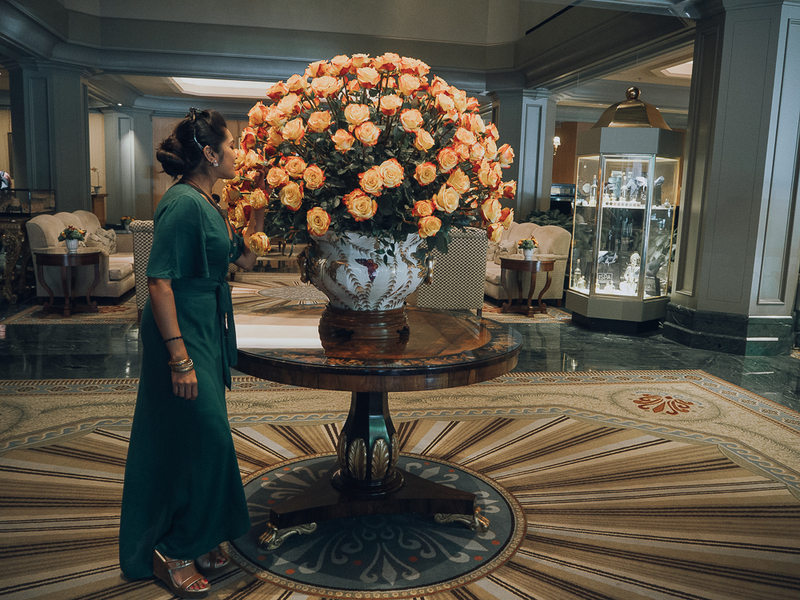 One of which was learning about the beautiful 12-dozen roses (the color representative of the season) that are carefully crafted to deck up the front lobby to greet the hotel guests. It was, in fact, the first thing I had noticed as I walked into the hotel the previous night and I had thought to myself, are these real flowers? If yes, then whoa, it is some real piece of work! 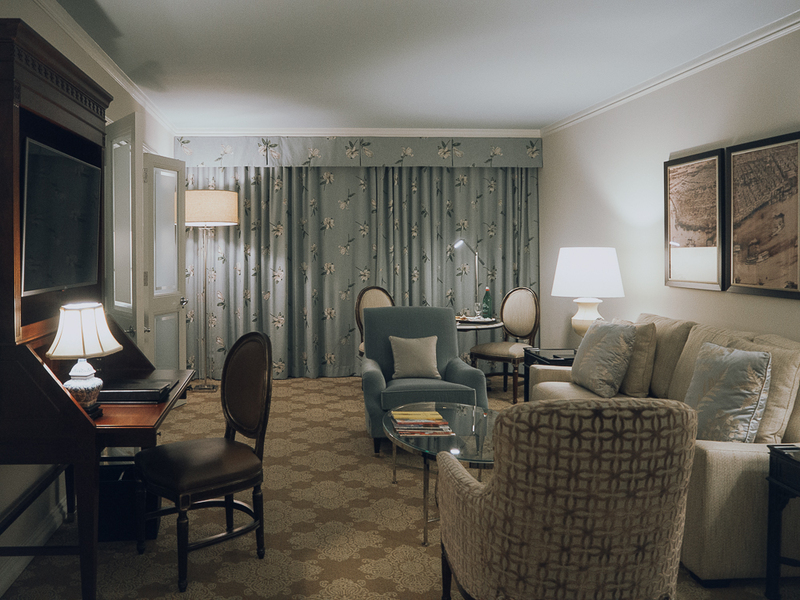 And indeed, it was… You can definitely sense a touch of history and grandeur in every corner of the hotel. 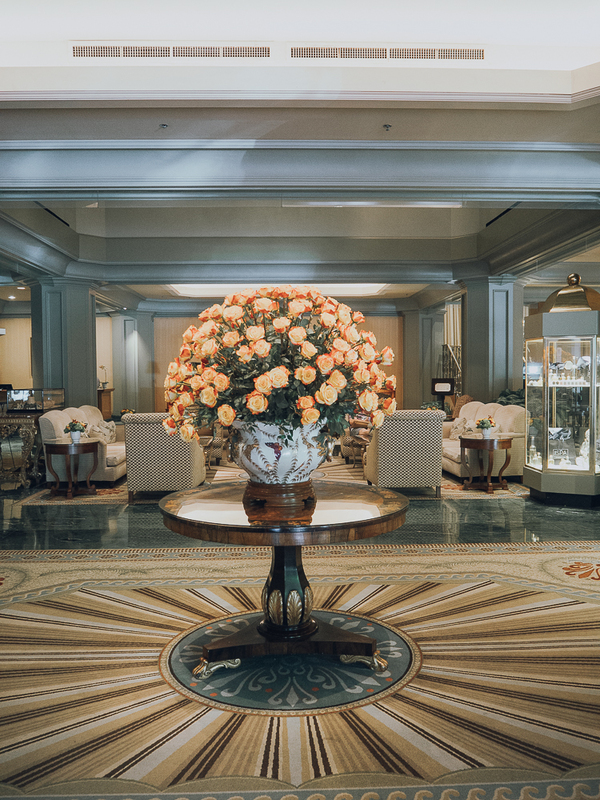 The lobby is spacious and elegantly designed with many authentic fine art and furniture. 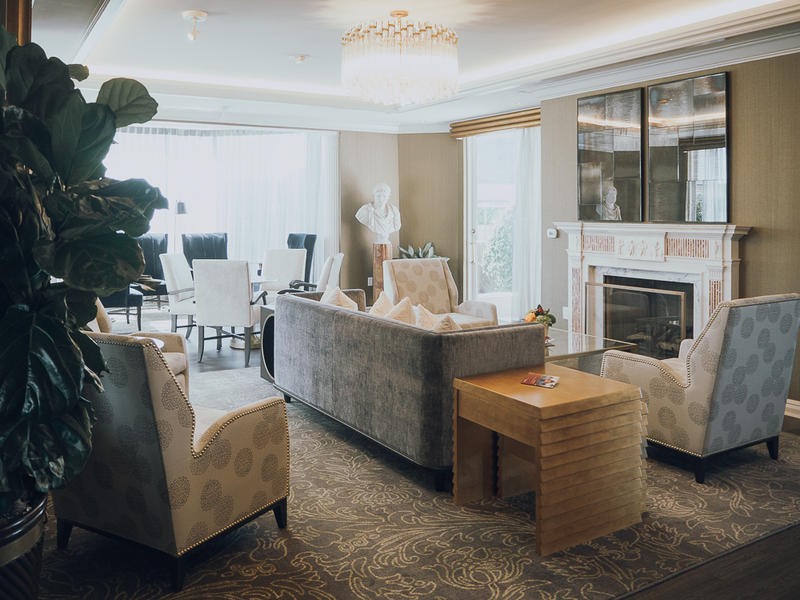 Apparently, the original owner loved art and it is quite clear when you take a look at the collection that is on display throughout the hotel, especially in the seating area by the lobby, and the restaurant, bar and lounge area on the second floor. 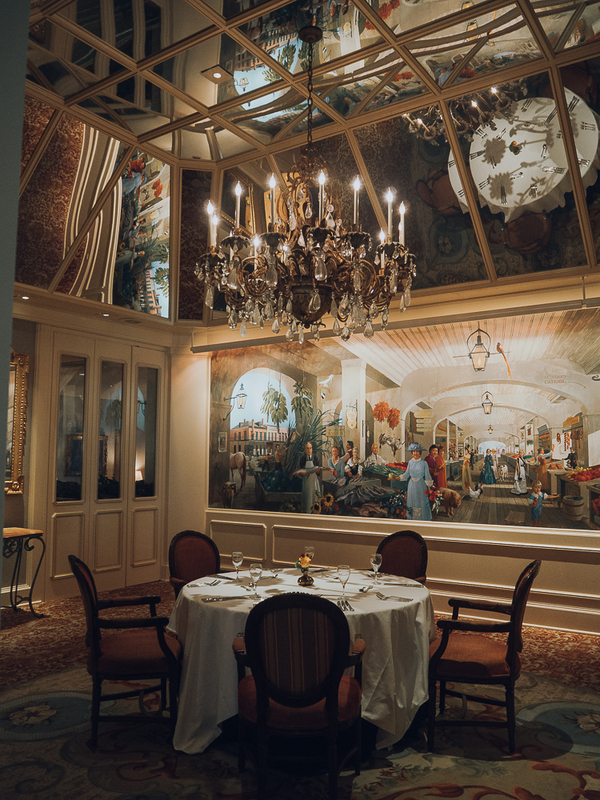 One of the paintings by Gainsborough in the lobby is apparently worth about $2 million and the total worth of just the artwork across the hotel is worth about $10 million. I was speechless! 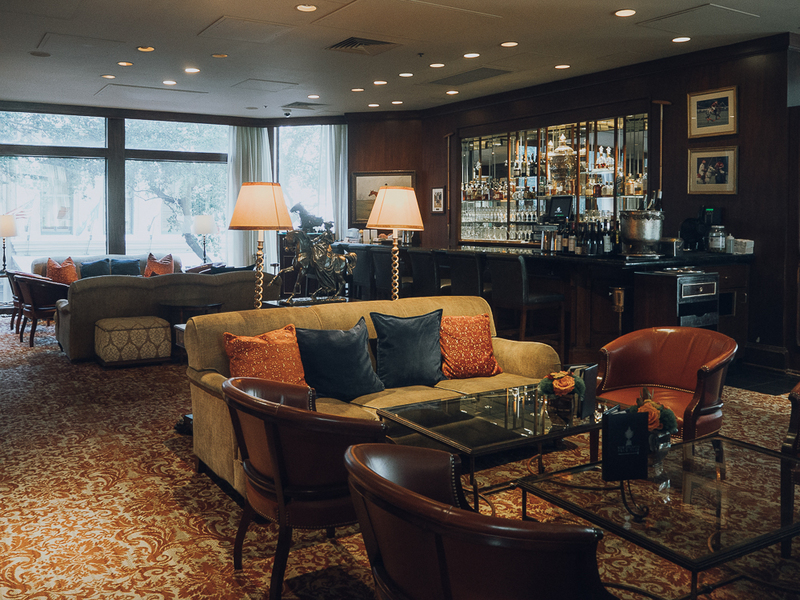 There are multiple dining options at the hotel, including an award-winning restaurant, The Grill Room which serves an upscale fusion of classic comfort food and Southern cuisine with live jazz in the evenings. 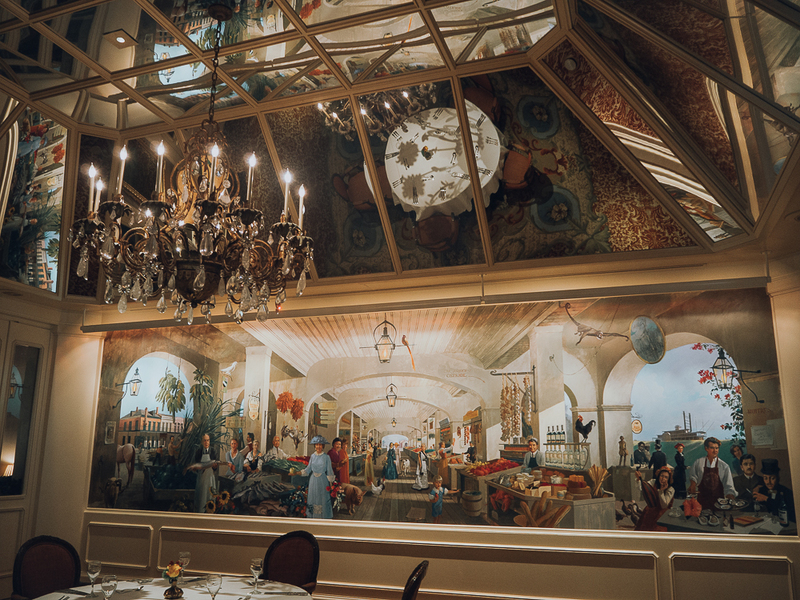 Le Salon serves traditional English tea with harp or piano music, and the Polo Club Lounge serves small plates, classic cocktails, and an extensive wine list. The club level has its own perks, my favorite of which was hands down the view from the deck. 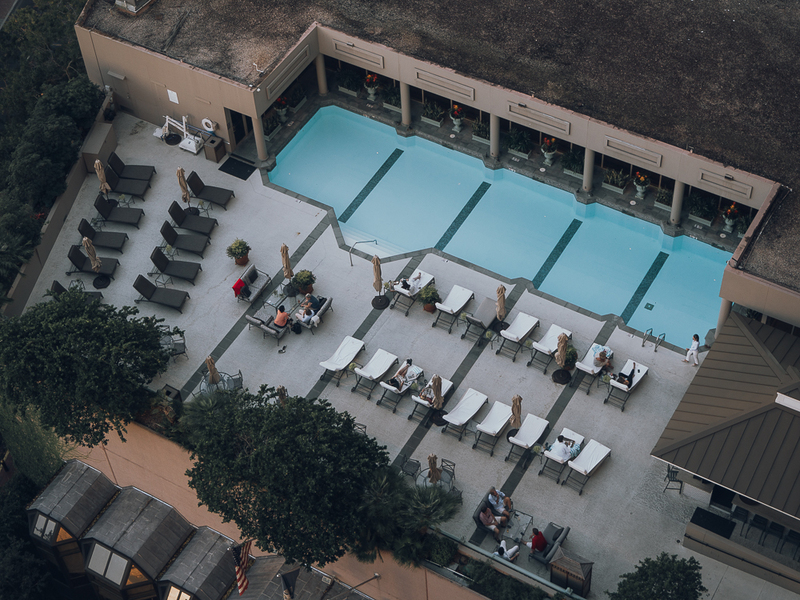 The rooftop swimming pool and the Waterman Poolside Bar are a nice way to relax and take in the beautiful views of the city. Unfortunately, I got confused with their closing time and stopped by right after they were closed that night, sigh! And then off I went exploring NOLA. 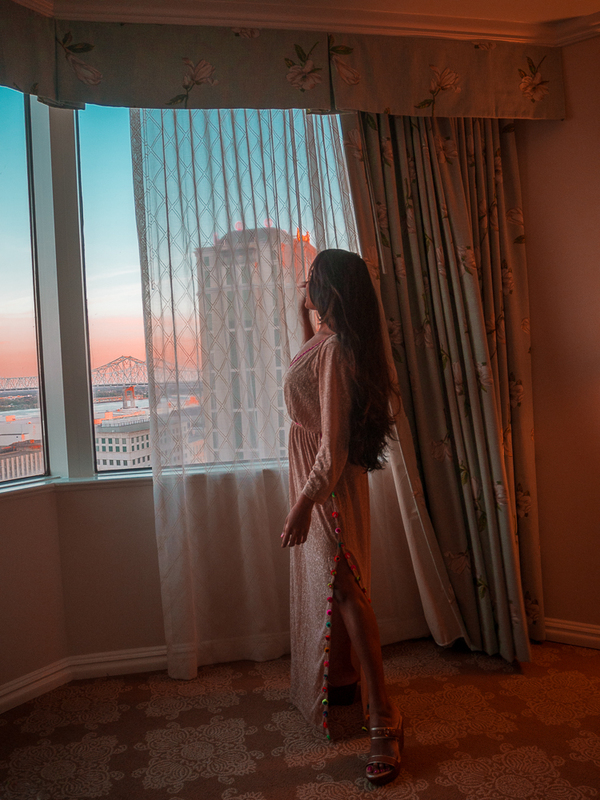 The hotel’s location is such that it is close to everything - it is located in the business district right across the street from Harrah’s casino. 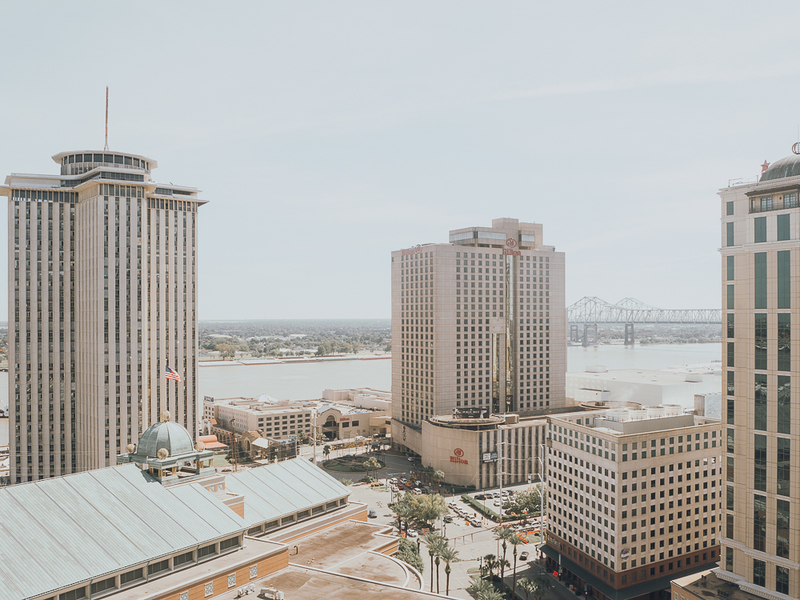 It is only a few walking blocks from the French Quarter, Bourbon Street and the Warehouse district, and literally 5 mins from Canal Place and the outlet collection at Riverwalk. It is also within walking distance of many restaurants, cafes, and nightclubs. 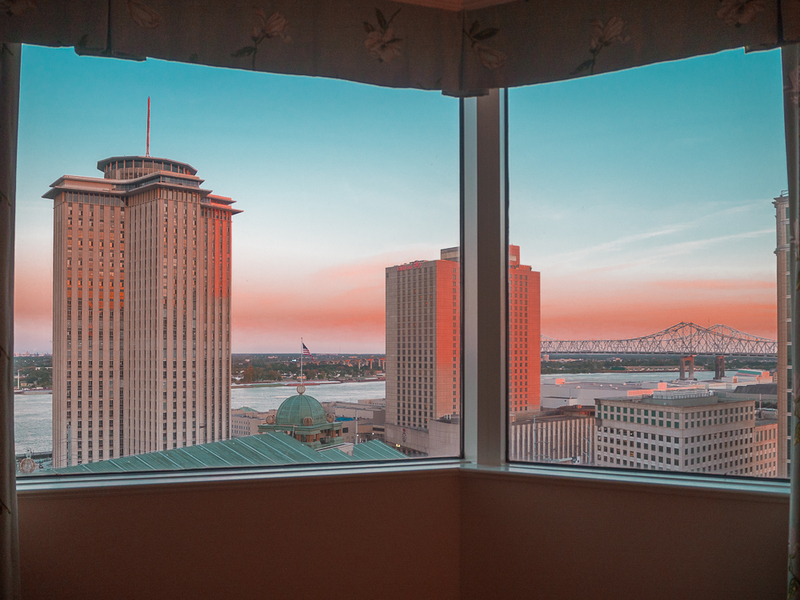 The biggest surprise though was when I got back to the hotel in the evening before I headed out for the night - the most stunning and unexpected sunset caught my attention as I was flipping through pages of a magazine from the comfort of the plush bed in my suite... at that moment, I was, in fact, reading about the NOLA sunset with a beautiful sunset photo right next to it. I didn’t miss out on the sunset after all (read about the inside joke here ;)). With it’s opulent English and French chateau lifestyle interiors, first class staff who are genuine and personable, and luxuries every step of the way, goes without saying that I enjoyed and soaked up every minute of this upscale retreat and the luxurious experience in the heart of the Crescent City at the Windsor Court Hotel. 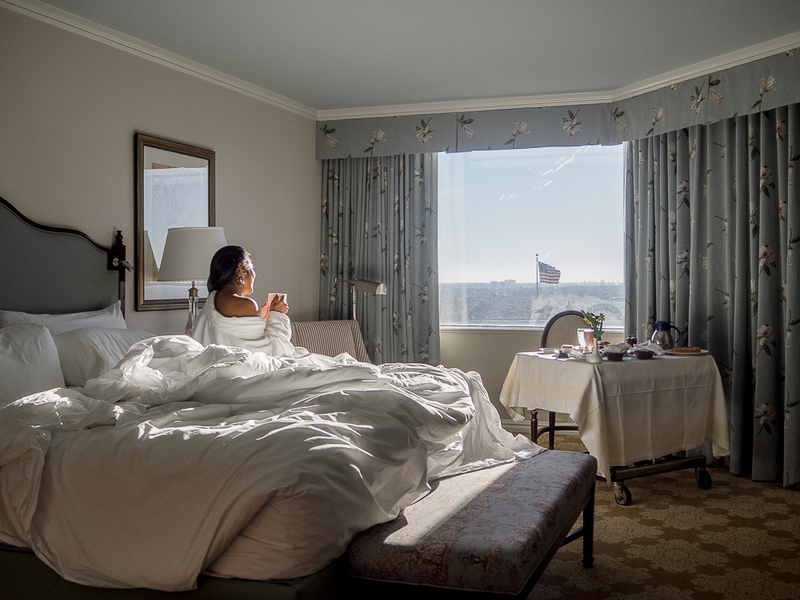 I can’t wait to return soon with my hubby to enjoy the romantic side of the hotel and the stunning views of the river and the canal from the balcony and large windows of the suite. 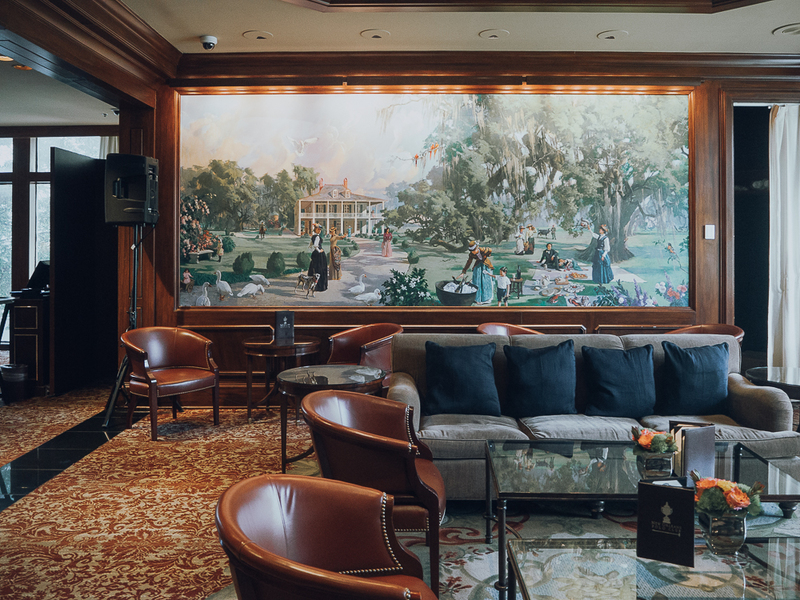 The Windsor Court Hotel is the place to stay at in New Orleans if you love the small details and enjoy a posh vacation!